The University of Colorado at Colorado Springs' new Science and Engineering Building earned a gold certification from the Leadership in Energy and Environmental Design program sponsored by the U.S. Green Building Council. LEED is the council's rating system for the design and construction of energy efficient and high-performing green buildings. 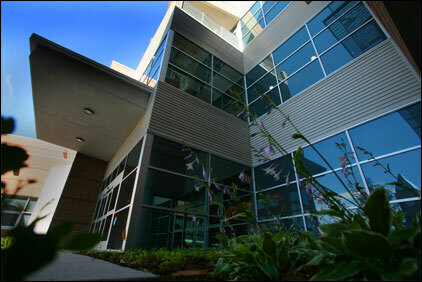 The Science and Engineering building has numerous energy- and environment-saving features such as thin-film solar panels, a heating system that recovers exhaust from laboratories, an ice storage system that saves air conditioning costs, high-efficiency windows, energy-efficient lighting with occupancy sensors, water-saving fixtures, and extensive use of low-chemical paints, adhesives, sealant, carpet and wood products. "This award is significant because it shows what can be done when the design and construction industries and government work together," said Brian Burnett, the campus's vice chancellor for administration and finance. UCCS now has two LEED-certified buildings, the most of any other southern Colorado institution, and will seek more certifications for projects that are under construction. The campus formally dedicated the 159,000-square-foot Science and Engineering Building on Aug. 6. It houses departments of biology, physics, mechanical and aerospace engineering as well as the CU Institute for Bioenergetics and the National Institute for Science, Space and Security Centers. The building features classrooms, offices, laboratories and a K-12 Center to assist teachers and to encourage youngsters to consider careers in science and technical study.